Asia Leisure, a subsidiary of Asia Capital PLC opened its fifth leisure property in the southern coastal belt, ‘The Habitat’ Kosgoda recently. 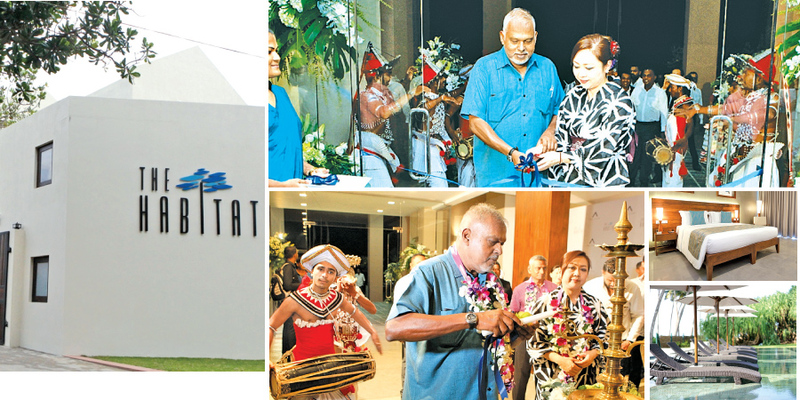 Initiated with an investment value of US Dollars five million in partnership with a consortium of Japanese investors, The Habitat provides modern luxuries to travellers. Commenting on the Company’s latest venture, Asia Capital, Group Chief Executive Officer/ Director, Stefan Abeyesinhe said leisure properties focus on catering to modern travellers who seek a sense of wonder. `The Habitat’ is a small-scale luxury hotel that offers all the modern day requirements such as Wi-Fi, room service and its key differentiation being its 26 deluxe rooms as well as two suites offering ocean views from all angles of the room. The property will cater to its clientele’s high expectations with two specialty restaurants, a bar, a magnificent pool lying close to the turquoise Indian Ocean, luxurious Ayrvedic bath amenities, spa facilities, a gym and complimentary high speed Wi-Fi. It also provides easy access to a number of local attractions including the Sea Turtle Hatchery in Kosgoda, River safari opportunities in nearby Madu River, water sports for the adventurous, a Moonstone mine, a traditional mask workshop and museum in Ambalangoda, the UNESCO heritage site of Galle Fort and whale watching in nearby Mirissa. “The Habitat will remain true to our signature Brand of excellent service standards combined with personalization and customization for the benefit of our guests. We consistently provide superior service elements to our guests at all our properties with specific focus on allowing each guest to experience a truly personal service that far exceeds their expectation during the stay,” Asia Leisure Chief Executive Officer/ Director, Reyhan Morris added.